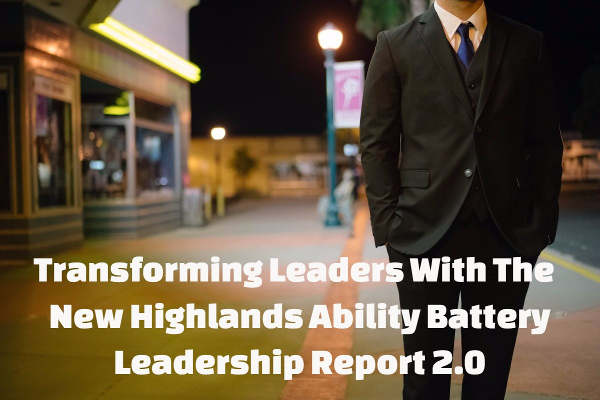 Today, The Highlands Company released the Highlands Ability Battery (HAB) Leadership Report 2.0, which is designed for industry leaders and C-level executives! After taking the HAB with a certified consultant, leaders now get an enhanced look at leadership behaviors and concrete suggestions for improving leadership traits. 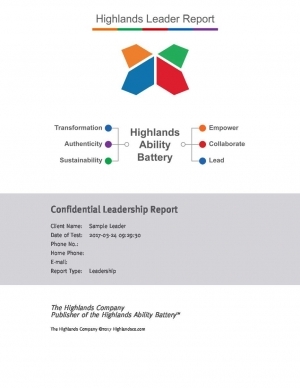 Why Business Leaders Choose the Highlands Ability Battery? Creates self-awareness. How do your colleagues and team see you? Helps develop an effective leadership style. How do you naturally lead? How can you capitalize on those leadership traits? Shows you how to communicate better. What’s the best way to get your point across? Informs your hiring decisions. What would happen if you knew your blind spots and how to correct for them? Has so many uses! The HAB provides an objective tool for leaders to create their own customized professional development plans, seek meaningful mentoring, and map and navigate their careers. Organizations choose the HAB, too. Organizations work with Highlands Certified Consultants to engage current and potential leaders in their own development, establish workplace loyalty, and so much more. How Does the Highlands Whole Person Method Work? You select a Highlands Certified Consultant to administer the HAB either through an individual arrangement or group leadership development program. Find consultants in our online directory or by contacting us for a personalized recommendation. You take the 3-hour HAB online without any advanced study or preparation. Review your customized 40+ page leadership assessment report that measures your natural abilities against all other leaders who have taken the HAB before you. The HAB includes 19 worksamples that measure dozens of your natural abilities, how they work together, and how they apply to your leadership role. Complete the HAB Debrief with your consultant (either individually or as part of the group) to apply results to your leadership challenges and opportunities. Additionally, you’ll learn about the Highlands Whole Person Model, which aligns your abilities with all aspects of your life. What’s Different About the New Leadership Report? The Highlands Company originally introduced the HAB leadership report in 2007. While useful then, the 2.0 report we have today includes so much more, which is exactly why we are so excited for its release. If you’ve taken the HAB before, then you may already know the previous reports were jam packed with valuable details. And now there’s more! Here’s What’s New in the Leadership Report 2.0. Interactive, easy-to-read design and layout. Click a hyperlinked ability and learn what it means and what your score says about you. Customized one-page profile that lets you see where your scores fall on 19 dimensions and how the combinations of your abilities work together. Simplified, graphic explanation of your personal style, approach to problem solving, and your ability to reason spatially; three critical leadership abilities. Rank ordering of your five Learning and Communication Styles–something all leaders must know! Concise explanations of your strengths and tips for potential blind spots. For example, if you have Immediate Time Frame ability, as a leader you need to learn to slow down and consider the intermediate and long-range repercussions of your decisions, solutions, and actions. Want more examples? Check out this sample report to see how the HAB Leadership Report works. Please also contact us to learn more and get started on your professional leadership development.